Each year, the BASIS.ed community has the pleasure of celebrating the accomplishments of our entire network of students, participating each year in the presentations of their findings. The richness of the accomplishments of the students knows no limit; we'll share with you each week the abstracts and videos for you to get to know some of our students. 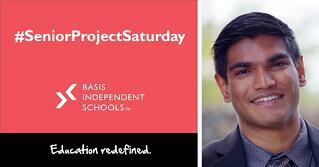 Meet Sammy Kanungo from BASIS Peoria and keep reading for his presentation abstract. unsustainable and unobtainable rate for many. In order to find out how one might go about finding a solution to this problem, I followed a startup company in its developing stages to observe the necessary steps and research needed, which included a vast amount of targeted market research and surveying of public opinion. Research such as this remains vital to obtaining success in the entrepreneurial world and allows for the creation of solutions to problems that people may not yet realize are present but will soon become apparent. For more, read Sammy Kanungo's blog documenting his experience during his Senior Project.